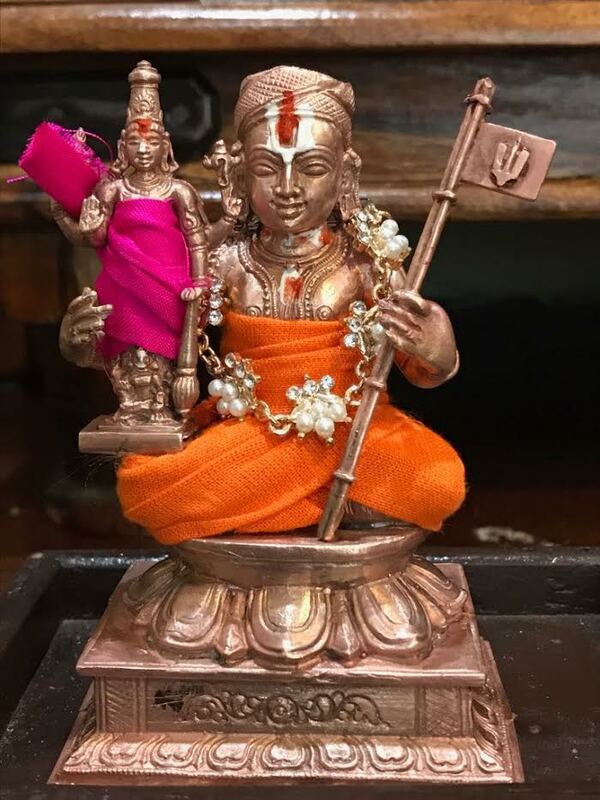 Ramanujacharyar is the Adhisesha Avataram in Kaliyugam. Adhisesha took avataram as Lakshmana in Tretha Yuga, Balarama in Dwapara Yuga and Ramanuja in Kaliyugam. Nammalwar was the Srivaishnava saint who gave the revered Nalayira Divya Prapabandam as Tamil Vedam in Alwar Tirunagari situated in Tamil Nadu. He lived long before Ramanuja was born in Bhoolokam. Madhurakavi Alwar wanted to revere a Vigraham of his guru Nammalwar and requested his guru for a vigraham. 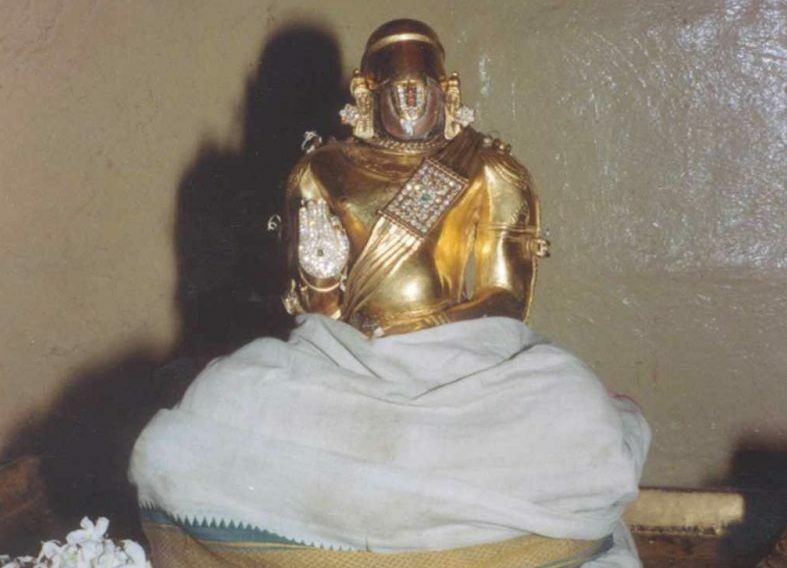 Nammalwar asked his disciple Madhurakavialwar to boil water from Tamraparani river nearby and the Copper idol of Ramanuja emerged after boiling the river water. Nammalwar explained that he is the Bhavishya Acharya or the Acharya for the future generations. It is to be noted that Tamiram in tamil means copper. The Ramanuja idol is also a swayambu idol made of copper as seen below. This Ramanuja Temple exists behind the famous Adhinatha temple Divya Desam in Alwar Tirunagari. The murty there can be seen till date there. 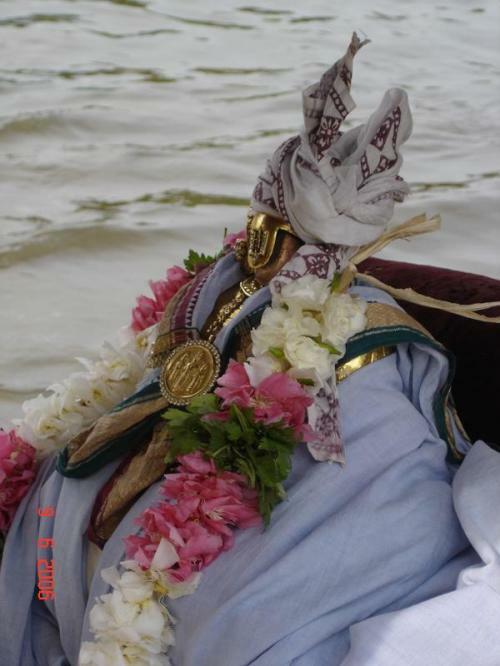 Madhurakavi Alwar boiled the water of Tamraparani river for the second time as guided by Nammalwar. Now he received the copper vigraham of Nammalwar as he had requested. 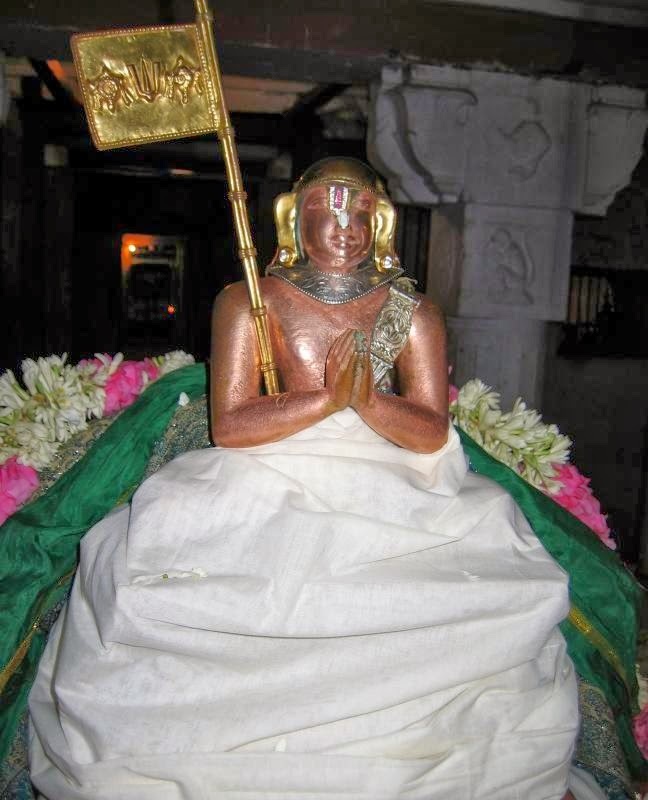 In Melkote Ramanujacharya brought back the famous Chella Pillai Perumal Utsava Murty from the Muslim King's Palace. 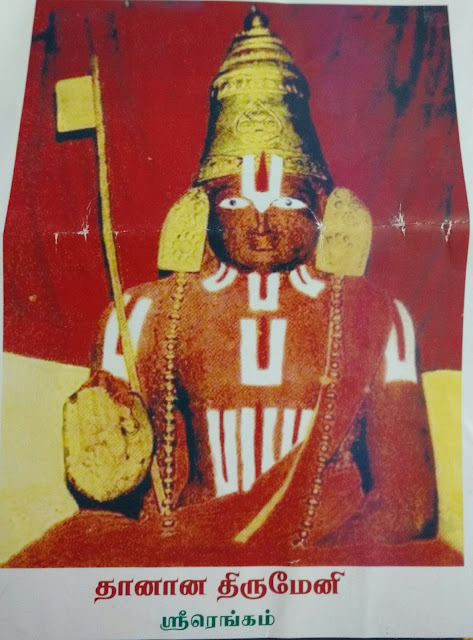 The Utsava Murty is hence known as Chella Pillai as Ramanujacharya called him sweetly that way and immediately the lord walked in the palace from his room and came and sat in Ramanuja's lap. 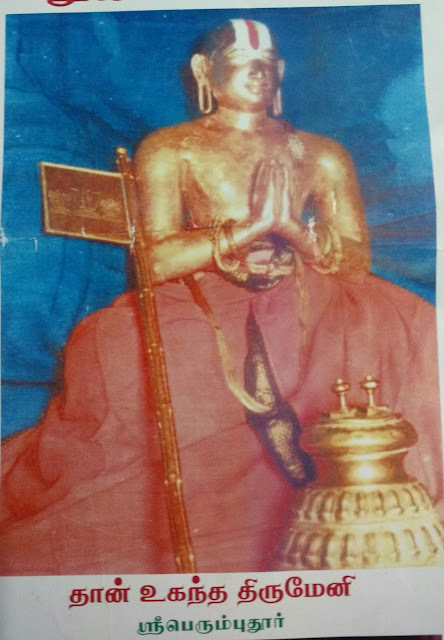 It is interesting to note that the Muslim princess was so attached to this Lord and could not bear his separation after Ramanuja brought him to the Temple. 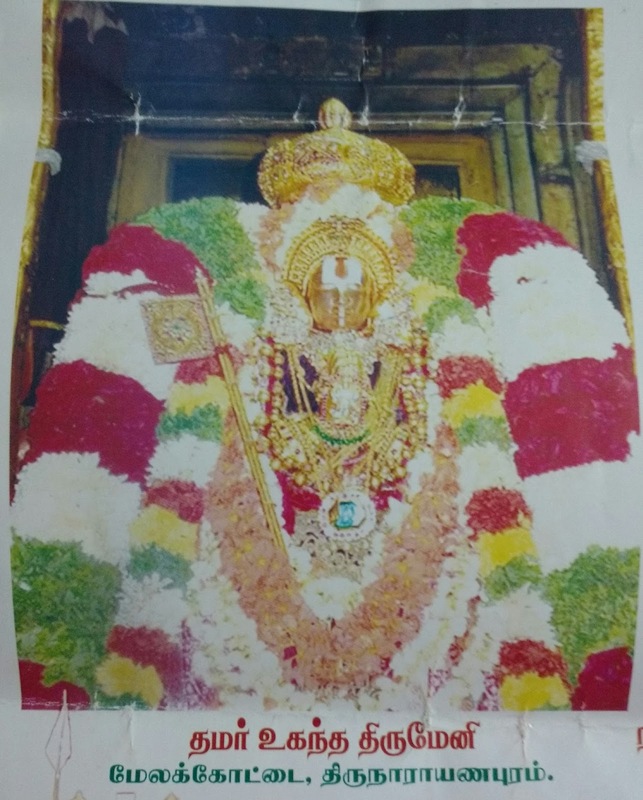 She merged her life in the Lord and is revered as Bibi Nachiyar in Srirangam. 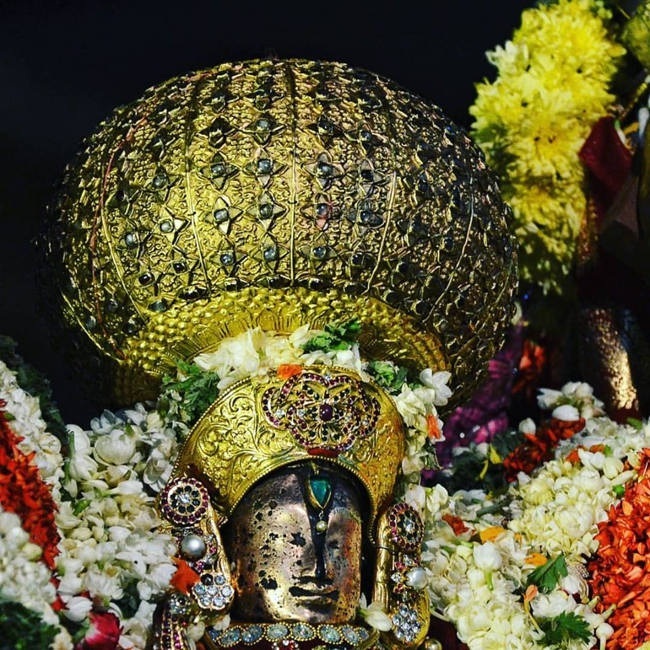 The Chella Pillai or Cheluva Narayana Swamy Vaira mudi Utsavam is also very famous wherein the Lord wears the Powerful crown studded with Diamonds once a year during Chitirai poosam day. 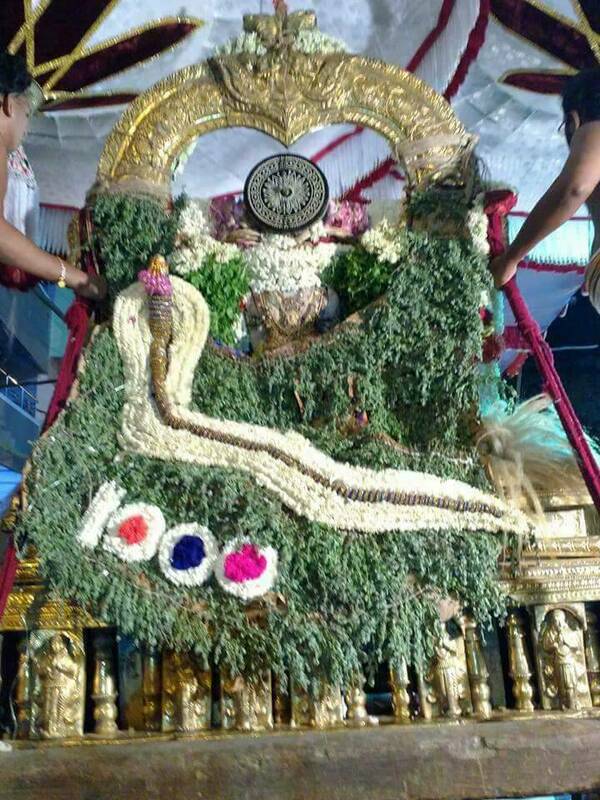 This Vaira Mudi or crown is said to belong to Lord Narayana himself in Ksheersagaram or Paarkadal. It was stolen by a asura and brought back from the asura to be consecrated here. 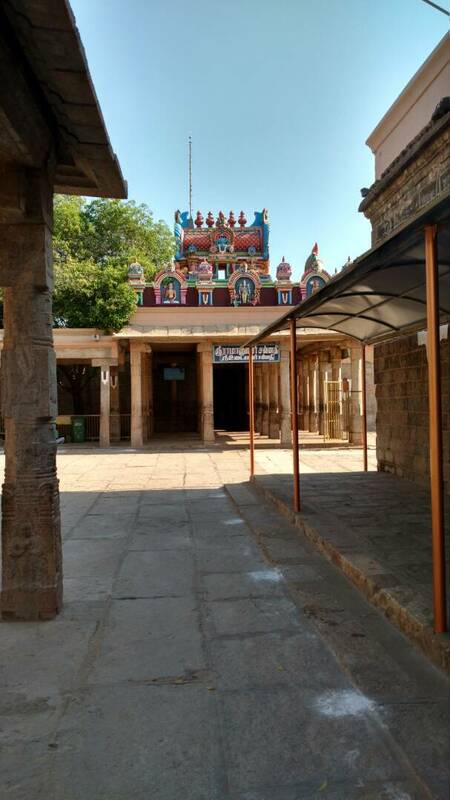 Ramanujacharya consecrated the Narayana Temple in Melkote. After organising worship procedures, Ramanuja was leaving Melkote and the disciples could not bear his separation. 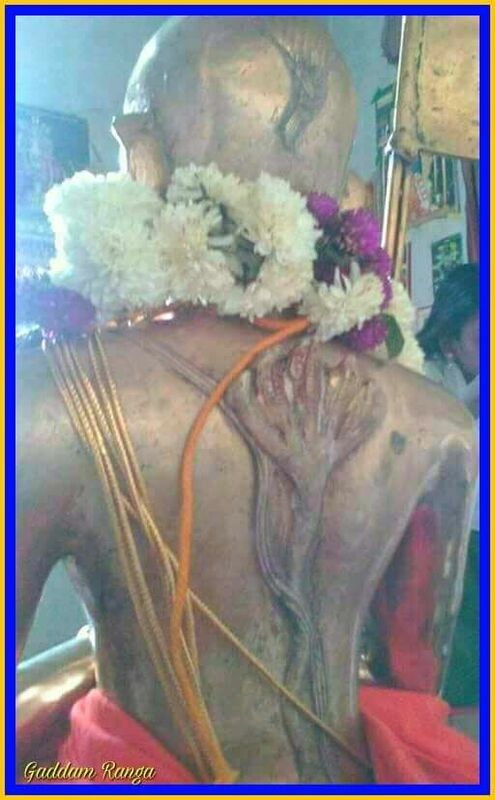 Hence Ramanuja asked disciples to make a Vigraham of himself and Ramanuja embraced the vigraham in order to transfer all his powers to the utsava murty. 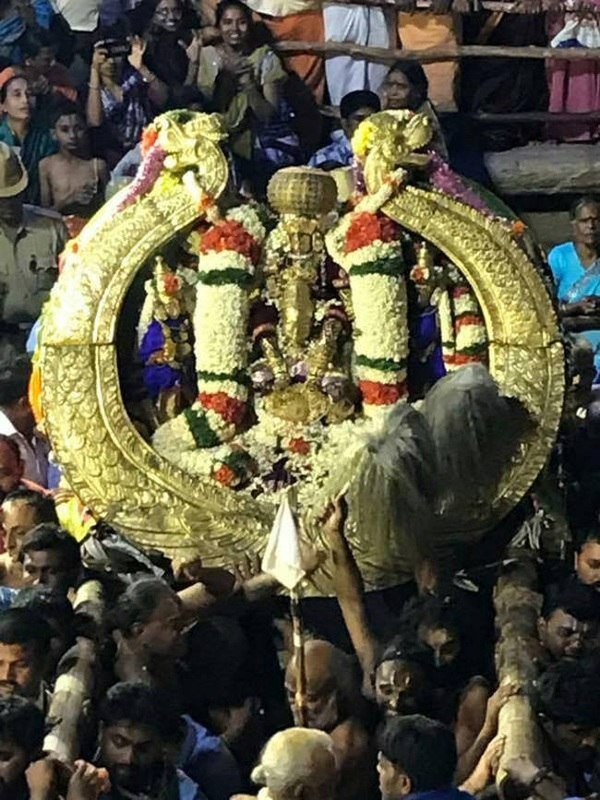 The Murty is known as Thamar Ugandha Tirumeni as seen below. 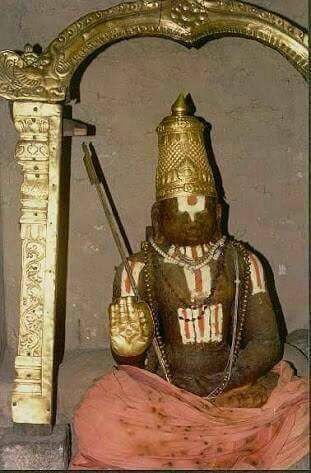 In Srirangam Ramanujacharya was giving a discourse to his disciples when suddenly he remained frozen like a statue for a few minutes. He regained normal consciousness a few moments later. His disciples asked the reason behind this unique behaviour and Ramanujacharya explained that in his Birth place Sriperumbudur, devotees had made a Utsava Vigraham of himself and was doing prana prathishta and eye opening ceremony for a few minutes. Hence Ramanujacharya said that he had to go there to Sriperumbudur in sooksham or subtle form for the Prana Parthishta. 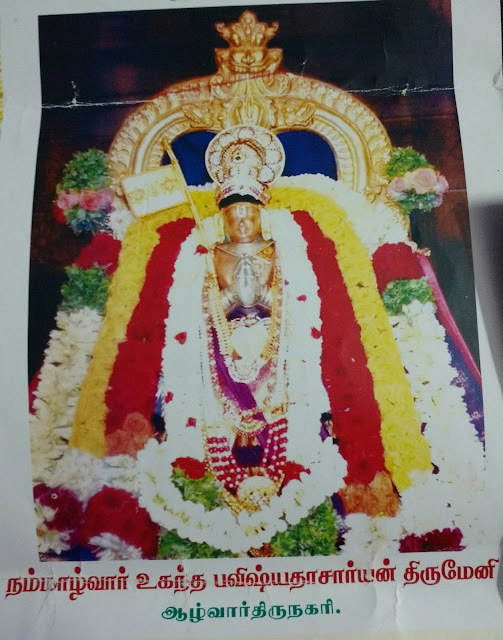 Hence the murty is known as Thaan Ugandha Tirumeni in Sriperumbudur as seen below. 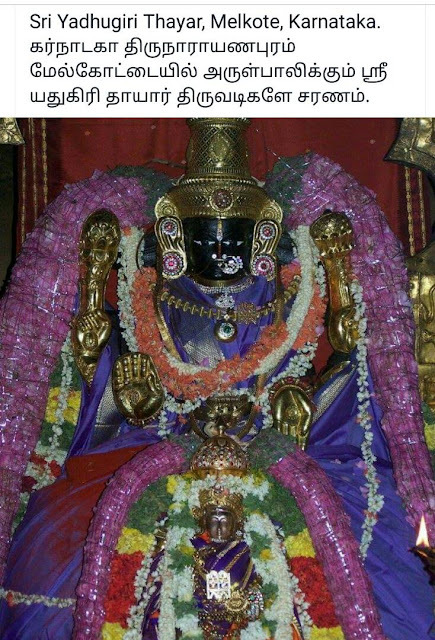 In Srirangam temple, Ramanujacharya is present with his physical body for the past 1000 years and it is God's Grace that we are able to see the Sthoola Shariram of the Acharya. This is testimony to the fact that Acharya is the Adhisesha Avaratam. No other preservation mechanism is carried out for his body except for Pachai Karpuram and Kumkuma poo being applied in this Tirumeni. He attained the lotus feet of the Lord in Magha Sukla Paksha dasami, Saturday in 1137 AD listening to Diva Prapandam. The Eyes of Ramanujacharya and his nails can be seen clearly till date when the archaka carries out the aarthi of Ramanujacharya.